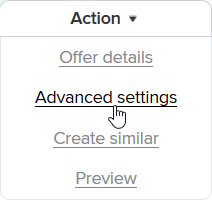 Once you create an offer, it can be edited in Advanced Settings. General Info block lists basic information about the Offer. 1. Offer Name is the name of the product offered, which can contain any other necessary information. 2. Description – brief offer summary that gives an idea of what is being promoted. 3. Preview URL is used by publishers to preview where this Offer directs traffic. Usually, this the page shown after clicking on the tracking link. Preview URL should start from http://. 4. Offer URL is used to track the user session and shows where traffic flows after a user clicks on this offer. 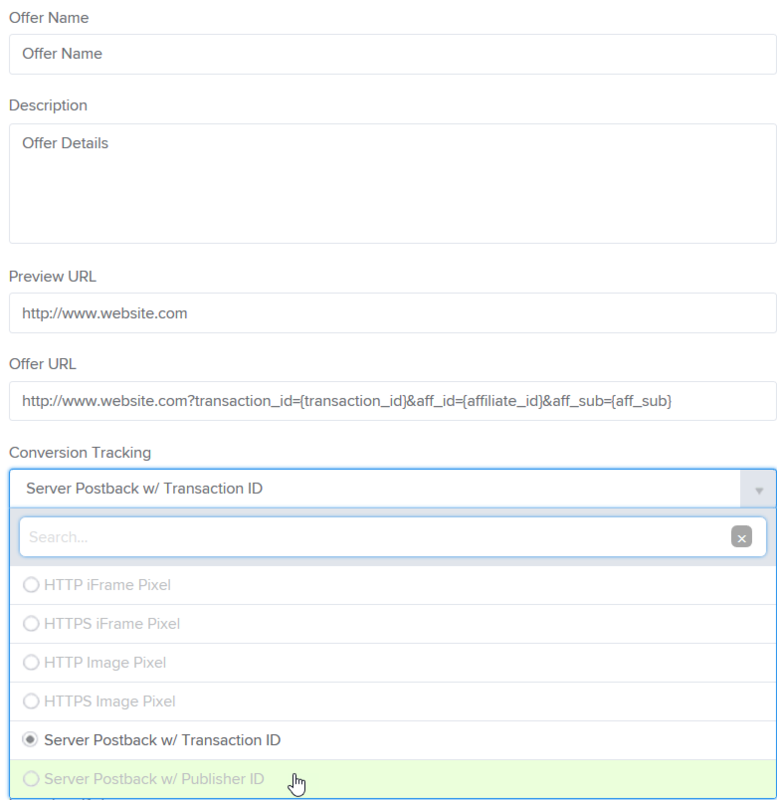 Depending on Conversion Tracking selected below, you can specify various variables for server postback tracking (transaction ID, Affiliate IDs, Sub IDs, etc), so the form can identify where exactly traffic came from. 5. Conversion Tracking shows the method of tracking clicks and conversions. Read here more about conversion tracking. deleted - offer is not available. 7. Offer Categories - select one or more categories for this offer from the list of active categories created in your platform. You will not see this field if you have no offer categories set up. Read more about Offer Categories. 8. Ref ID is a value that can be passed through the Default Offer URL for your own purposes. 9. Expiration Date - the date when offer expires. By default, the expiration date is one year from offer creation date. 10. Note - any notes left by one of the administrators, not visible for publishers. 11. Currency - select the default currency for this offer. 12. Publisher Type - select the type of the publisher (All/Mixed, Mobile, Callcenter, Search, Email, Premium Display, Path, Contextual, Mobile Premium Display, Offer Wall, Mobile Path, Pop). 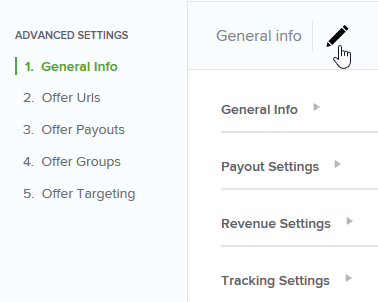 Payout Settings block allows configuring payout type, method, and the amount that your publishers earn from this offer. Offer Payout Settings have a higher priority than access mode selected in publisher settings. For example, if you enable Fixed Pricing and set Spending to $20 in publisher settings, and then select Cost per Conversion payout type and set it to $30 in offer Advanced settings, each conversion for this offer will cost $30. Cost per Thousand Impressions (CPM) - the fixed amount that publisher earns for every 1000 impressions. 2. Payout Method - select the payout model that you wish to use: select Default to apply the same payout for all your Publishers, or Tiered - to configure different payouts for different Publisher Tiers on HasOffers. If you wish to use default publisher Fixed Pricing settings for this offer, select Cost per Action type. Revenue Settings block allows configuring revenue type, method, and the amount that you earn. Revenue per Thousand Impressions (RPM) - the fixed amount that you earn for every 1000 impressions. 2. Revenue Method - select the revenue model that you wish to use: Default - to apply the same revenue to all your publishers, or Tiered - to configure different revenues for different Publisher Tiers on HasOffers. The next set of fields depends on Revenue Type and Revenue Method selected above and allows setting specific revenue amount(s), they work similarly to Payout Settings. Tracking Settings block contains options for a number of tracking-related settings of the offer. This block is not critical for basic offer creation. Any other pre-configured tracking domain. 2. Redirect Offer - select one of the existing offers in the drop-down list, to which you wish to redirect traffic. Offer is paused or expired. II. When setting redirect traffic from one offer to another, both these offers must belong to the same Offer group. 3. Conversion Cap - enter the limit of conversions that publishers can drive to this offer. When the cap is reached, traffic will be redirected to another offer selected in Redirect Offer. 4. Private - select to show this offer only to approved publishers. 5. Require Approval - select to require publishers that sign up for this offer to apply and get approval on HasOffers. 6. Require Terms and Conditions - select to require publishers to accept terms and conditions of your platform. 7. Terms and Conditions - enter the text of your terms and conditions. 8. Custom Variables - select to add custom variables to the tracking link. Read more about custom variables. 9. Direct Links - select to enable publishers to link directly to their site without redirecting through the HasOffers tracking servers. Read more about Direct Links. 10. 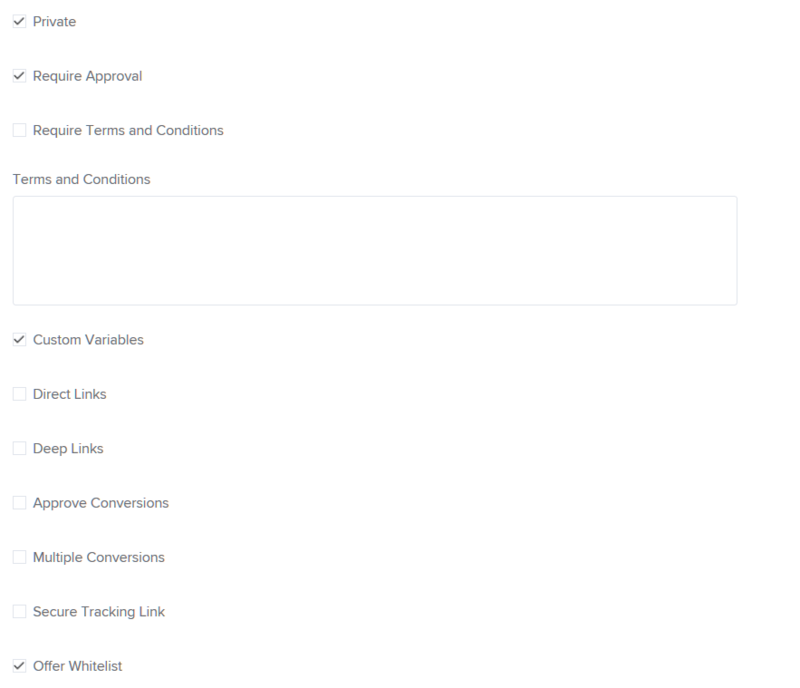 Deep Links - select to enable publishers to the specific page of the advertiser’s site to direct traffic to the specific category or product pages. without redirecting through the HasOffers tracking servers. Read more about Deep Links. 11. Approve Conversions - select to assign the Pending status to all valid conversions that come from this offer. Then each conversion should be manually approved or rejected on HasOffers and then shown in Publisher Conversion Report with corresponding Conversion Status. This is usually used when there is a high payout for each conversion. 12. Multiple Conversions - select to allow more than one conversion from a single session (transaction ID). 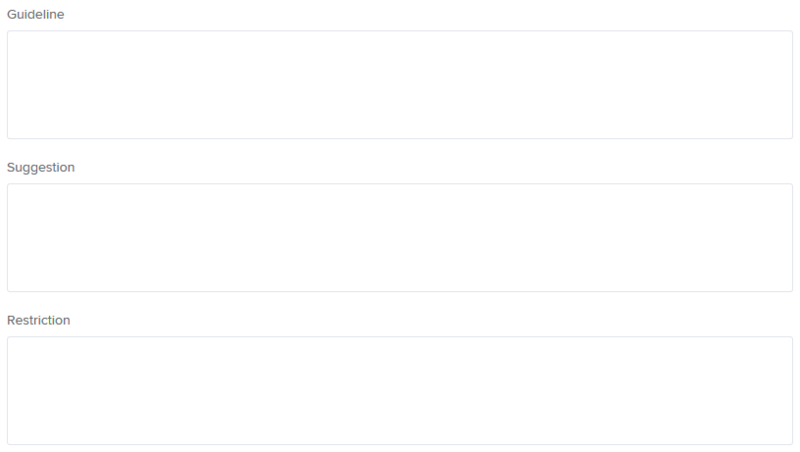 When disabled, conversions on the same transaction ID are rejected. 13. Secure Tracking Link - when enabled, any conversions from non-encrypted URLs will be rejected. If you use a global postback URL to track this offer, leave this setting disabled. 14. Offer Whitelist - select to allow postbacks only from a specified set of IP addresses. Read more about Offer Whitelist. Impressions - session tracking starts at the impression (a cookie is placed in the user's browser before they click a tracking link). Click Save as soon as you are done.